For the past few years, I've been fortunate enough to teach writing at an art school. One particular joy (among many) is that my classes are comprised of artists and designers; I love to hear from both camps (which overlap, certainly). This past semester, we spoke quite a bit about "design thinking"--that mix of thinking creatively and critically. We always discuss art and design manifestos, and I just came across "The Fixer's Manifesto" (offered by Sugru, a company which makes a "moudable glue"--very cool!). The manifesto applauds the ability to mend make an object last longer. I love the declaration that "A fixed thing is a beautiful thing." I'm not at all handy. I find a way to destroy almost every box I open, and sequential assembly does not come naturally to me. When I was younger, I was notoriously awful at the "spatial relations" and "mechanical reasoning" sections of aptitude tests--my brain just isn't inclined to put stuff together. However, I absolutely value good design and objects that are meaningful and long-lasting. And even the smallest of repairs or tweaks can change the way we interact with things--a sweater becomes the sweater with the buttons that you lovingly replaced; tarnish can be rubbed from silver. Adapting this rule as an artist is slightly trickier. I don't think that every poem I draft deserves to be "fixed," although many require a new button or a little superglue. A poem is not a "product," exactly; it doesn't solve a specific problem or need. However, a poem is a thing--a thing that the maker or user (reader?) might not need or use in the same way over time. Is obsolescence an issue when it comes to art? (There's an art gallery in L.A.that I love called Obsolete). I lean toward saying that it is...but I don't know that we're burdened with the same ethical concerns that designers are in this regard. What do you think about all this, friends? I have learned to treasure book recommendations. Not just someone's mild tweet or positive rating--but when someone tells me, "You absolutely must read THIS." Over the holidays, I love to catch up on my reading for pleasure (even typing this makes me feel rather giddy). So, lovely readers and friends...what have you read that you feel compelled to praise or share? Please and thanks. A few of the books I read and LOVED LOVED LOVED this year: Jennifer Egan's A Visit from the Good Squad; Leslie Jamison's The Empathy Exams, Marjane Satrapi's Persepolis, and Lesle Lewis's A Boot's a Boot. 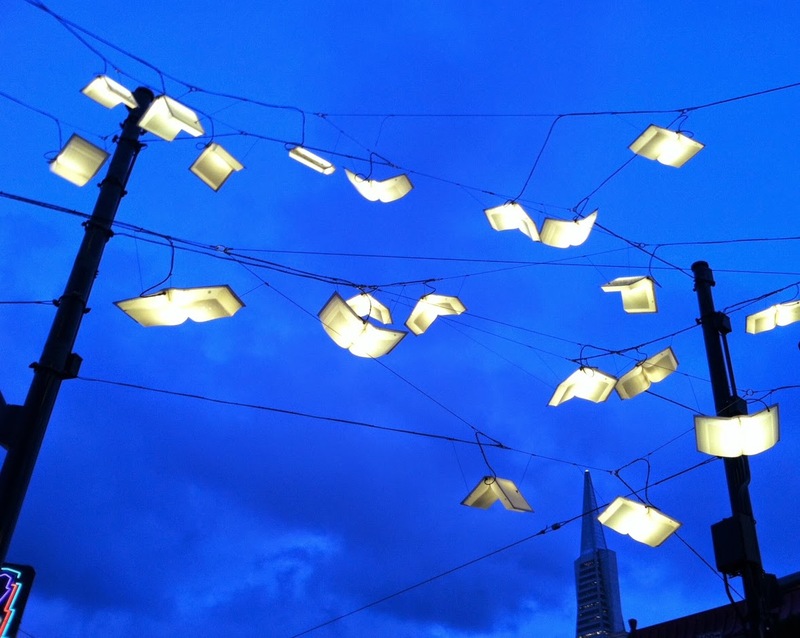 Spotted in San Francisco, near City Lights Bookstore! is pastry, split sidewalk, water. that can make the darkness bigger. 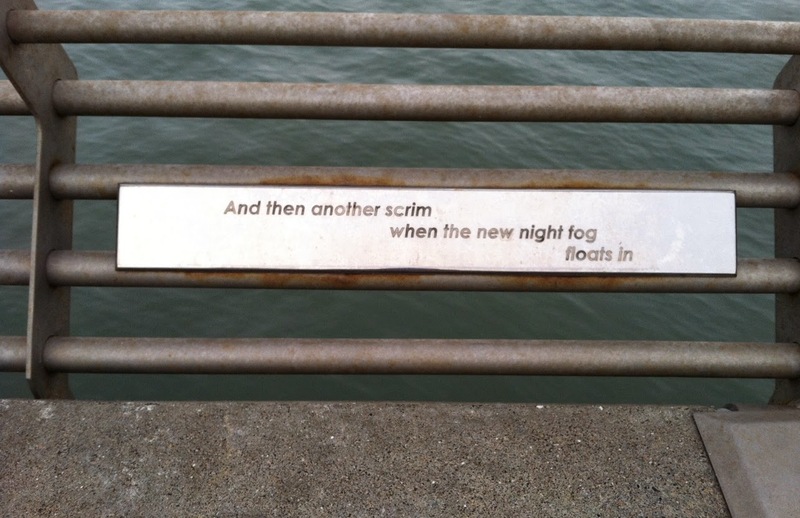 I found a poem along the railing of this pier in San Francisco! It's "The Changing Light," by Ferlinghetti. This week, I learned about Ben Grosser’s fascinating “Computers Watching Movies” project. Grosser has computers look at several movies, and has developed software that produces a sketch to approximate how the computer is seeing what it is seeing. This idea of computer vision is very thought-provoking to me. When artificial intelligence considers art, what does it perceive? Here’s a computer watching a scene from American Beauty. Watch the rest of the videos here. Computers Watching Movies (American Beauty) from benjamin grosser on Vimeo.